2 Hr Pumpkin Tour is $12/each, kids under 1/free: Hayride, pick a pumpkin, milk a goat, gather eggs, hold chicks & bunnies, time with cows, horses, sheep & goats & visit alpaca & emu! Offered 10/3, 10/4, 10/18 & 10/25 at 1PM, 10/10 & 10/17 at 10AM, 1PM & 4PM, 10/11 & 10/24 at 10AM & 1PM. 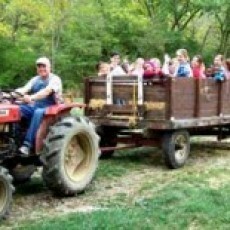 1Hr Pumpkin Tour (great for the very young) is $10/each, kids under 1/free: Hayride, pick a pumpkin, milk a goat, hold chicks & bunnies. Free apple cider & cookies on weekends. Pick-a-pumpkin fees vary by size from $1-$12 each. CASH ONLY. Reservations by telephone are required 859-781-5502.